2 HD Televisions with Blu-Ray, Netflix, Hulu, Xfinity On-Demand and More! 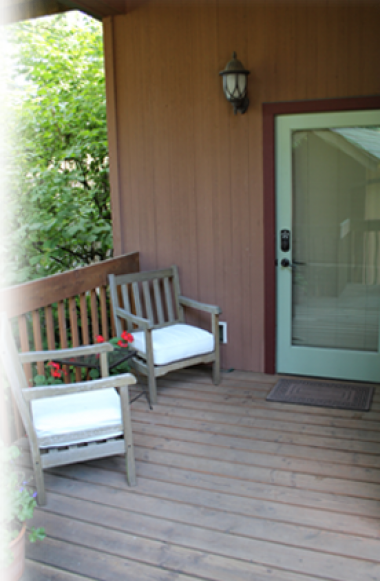 We couldn't have picked better accommodations and I would love to return again, it makes Eugene a vacation destination just to enjoy this place. Great stay with excellent hosts. Close to town with plenty of amenities included. Will stay again and recommend to anyone thinking about Eugene for a game or just a pleasant, quiet stay. They made us feel so welcome, at home, and special, Kevin and John should give classes on how to host. If we ever get a chance to return to Eugene, we'd love to come back! We highly recommend staying at Kevin & John's home! What a lovely little oasis - almost like a spa getaway with all the wonderful amenities. Wonderful, quiet, beautifully decorated, well-stocked, and in a excellent neighborhood close to our favorite end of Eugene. It was a perfect stay - thank you Kevin and John! View a short video of our Guest Suite. The Coppertree House Guest Suite is listed on both AirBNB and Homeaway. However, we also accept direct vacation rental requests for bookings. This is mainly for the convenience of return guests and referrals but we will consider all requests. If you have been referred to us, please let us know the name of your contact. Provide your Name, email & phone number. Please use the “Message” box to tell us a little information about yourself, your trip and/or your referral contact. Click “Calculate Quote” after you have selected the dates of your stay. Click ‘Request Booking’ button to submit your request. We will reply using the email you have provided. There is a 2 night minimum stay. Rates vary throughout the year starting at $95 per night during the winter. Rates for 7 or more days are usually discounted at least 15%. Weekend rates (Fridays and Saturdays) are usually $15 – $30 higher. There is a $15 per person, per night additional charge for more than 2 guests. The quote is approximate and includes a refundable $100 cleaning & Damage Deposit, as well as State & Local lodging taxes (11.3%). You are welcome to request a lower rate by changing the provided quote — we are happy to consider any proposed rate reduction but please don’t be disappointed if we decline to accept your suggested discount. We will contact you shortly after we receive your request (usually within an hour). We will provide you with an exact quote and a guest booking agreement. Once we receive your acceptance of the booking quote and the guest booking agreement, we will send you an invoice to pay (via Square). Your booking request will only be confirmed once we receive your payment.